Miguel Cotto is one of the most popular boxers on the planet, he has fought the who's who of boxing, here are some of the names Miguel has fought since turning pro in 2001; Lovemore Ndou, Paulie Malignaggi, Kelson Pinto, Randall Bailey, DeMarcus Corley, Ricardo Torres, Carlos Quintana, Zab Judah, Shane Mosley, Alfonso Gomez, Antonio Margarito (2), Joshua Clottey, Manny Pacquiao, Ricardo Mayorga and Floyd Mayweather Jr.
One more world level boxer will be added to that list tonight as Miguel Cotto will challenge for Austin Trout's WBA Light Middleweight crown. 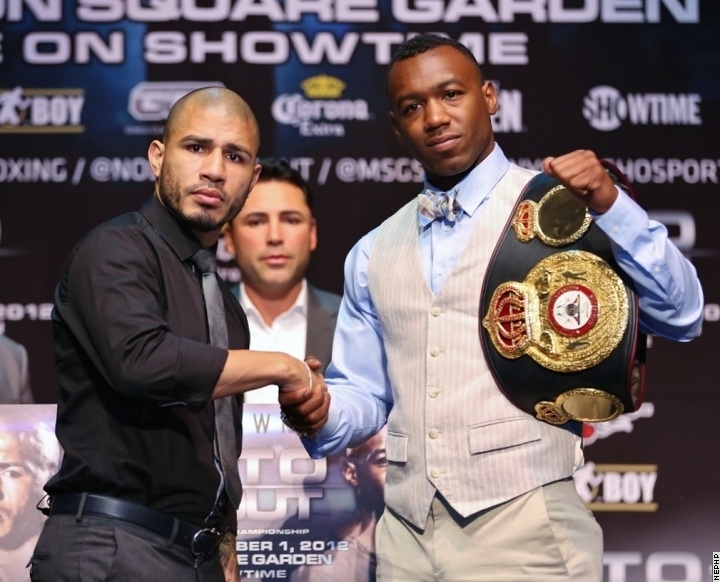 You have to give Cotto credit, he ALWAYS takes on the best. For that reason, he will one day be in the boxing Hall of Fame. Let's take a look at the head to head statistics for this fight. Notable wins Margarito, Mosley, Judah. Rodriguez, Alvarez. Notable losses Margarito, Pacquiao, Mayweather Jr. No losses. So as you can see from the stats, all the physical advantages are with the younger, Trout. But the experience and big wins are with the challenger, Cotto. If Trout uses his height and reach advantage he could well out-box Cotto, but if Cotto uses his experience in big fights and pressure wisely, he could take Trout out of his game-plan. I think a huge fight with Saul 'Canelo' Alvarez awaits the winner, will Cotto win and show us he is still an elite level fighter? Or will Trout win and become one of the biggest names in boxing? Tell me what you think by leaving a comment below.